1) The Lord Bishop of Durham (Herbert Hensley Henson, D.D.) preached the sermon at Roland Bradford's Memorial Service on 19th July 1925. It was also the occasion of the unveiling and dedication of a monument in Roland's memory. 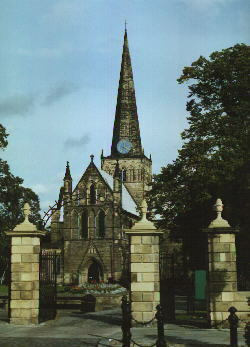 The location was the east wall of the north transept of St Cuthbert's Church, Darlington, County Durham. 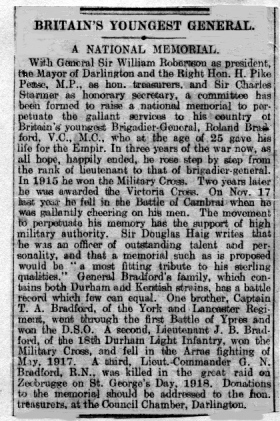 2) "The General Bradford Memorial Fund" was set up in Darlington and met with a ready response so that a memorial could be raised to Roland and his brothers. The large sum of £3,000 was contributed at the time this was reported. It was being devoted to a new Hospital in Darlington, the grand porch of which was to be called "The Bradford Entrance" (and three thousand pounds really WAS a LARGE sum of money in those days). 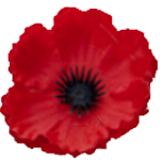 3) Click here to see a page containing photos of a memorial plaque and a rose window which were also given in memory of Roland at St. Paul's Church in Witton Park. 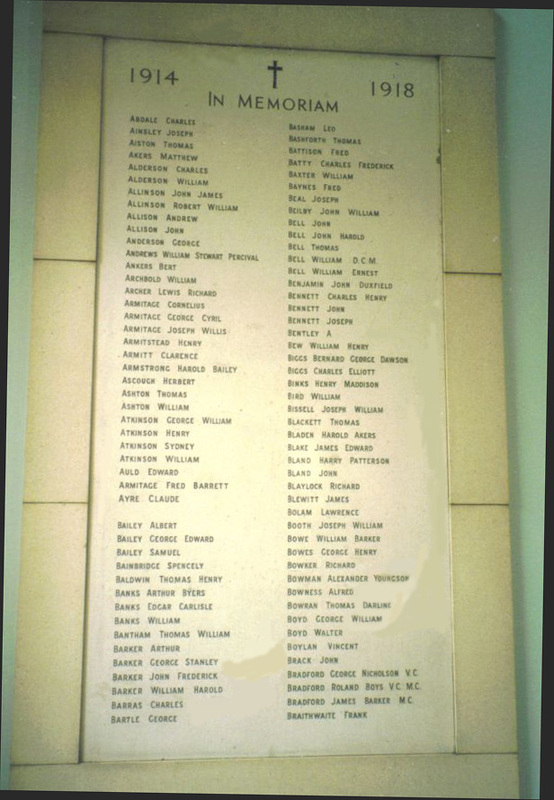 4) Click here to see page about a memorial plaque to the 4 Bradford Brothers which was installed in the chapel at Darlington's Queen Elizabeth Sixth Form College in November 1994 (called Darlington Grammar School in earlier days). Here are the words which Field-Marshal Earl Haig GCB, wrote in connection with "The General Bradford Memorial Fund"
I knew Bradford quite well and had personally followed his career with friendly interest for some time previous to his death. He was an officer of outstanding talent and personality; as a Battalion and Brigade Commander exceptionally young but particularly capable. His death was a great loss to the Army, and I and all who had known or served with him deeply deplored it. I feel with you that a National Memorial to such a gallant officer and gentleman would be a most fitting tribute to his sterling qualities. The example of his unselfish courage and devotion to duty is, in my opinion, worthy of being kept in continual remembrance by the Nation he died to serve." This newspaper article gave some details of the National Memorial Fund set up after Roland was killed.